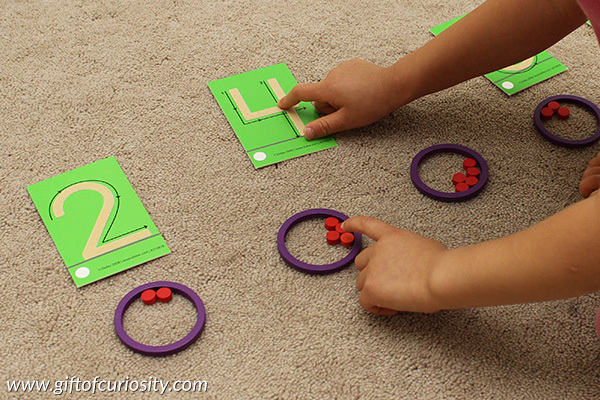 This Counting in Circles Montessori-inspired activity helps children learn number quantities and associate those number quantities with the written symbol for the number. 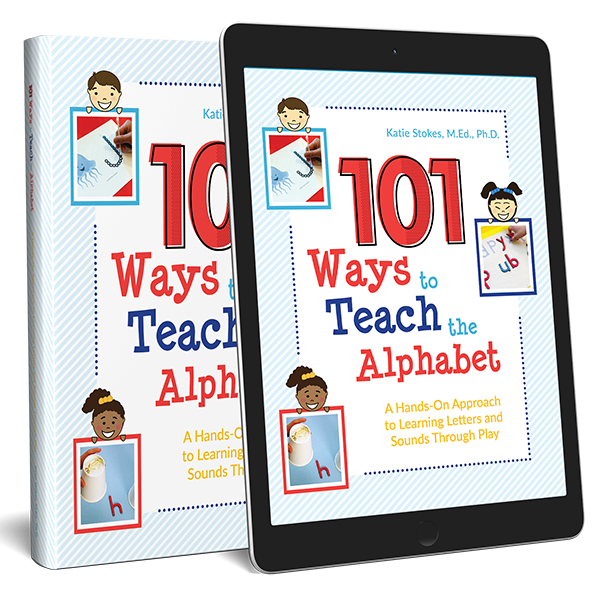 In general, children can understand quantities sooner than they can understand the number symbol associated with the quantity. For example, scientific experiments have shown that even very little babies can differentiate between a quantity of one and a quantity of two. What takes longer to develop is the understanding that ‘2’ is a written symbol representing the quantity of two. And many preschoolers and kindergarteners have not yet made this connection either. 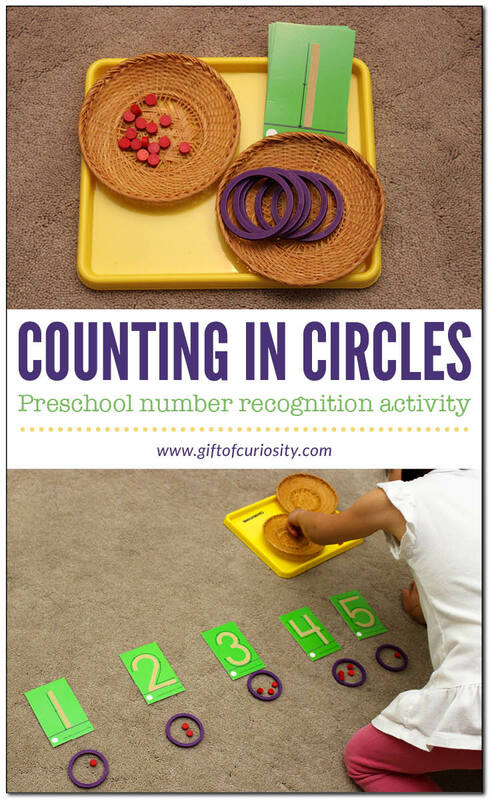 The Counting in Circles activity helps children to make the connection between number symbols, number names, and quantities. Tracing the sandpaper numbers also supports children’s knowledge of number symbols in addition to their emerging writing skills. 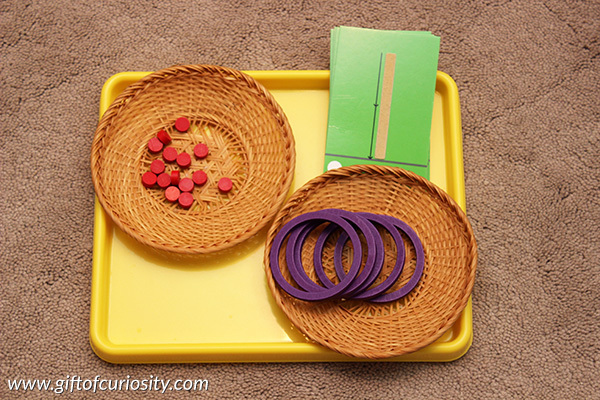 Note: See my math activities for kids page for more hands-on activities that teach numbers and counting. 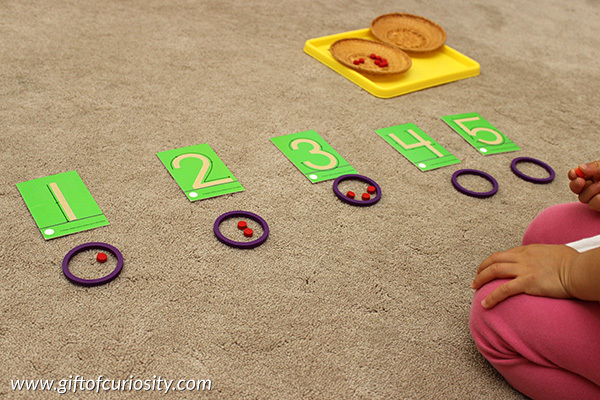 One way to use the materials is to have your child lay out the numbers in numerical order. 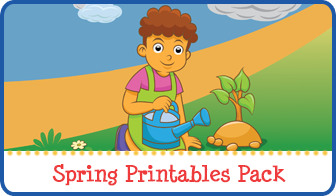 Encourage your child to pick up each number card and trace the number with their finger while saying the name of the number before laying the number down. Depending on your child’s skill level, you may wish to start with just 2 or 3 numbers. Or you may wish to go beyond 5 numbers. 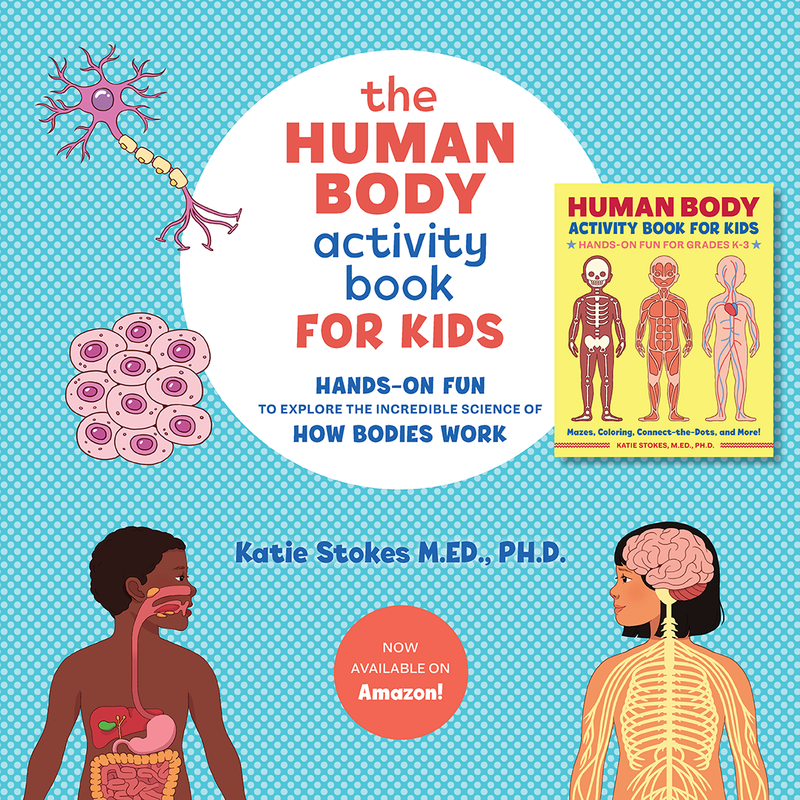 Tailor this activity to your child’s developmental readiness. 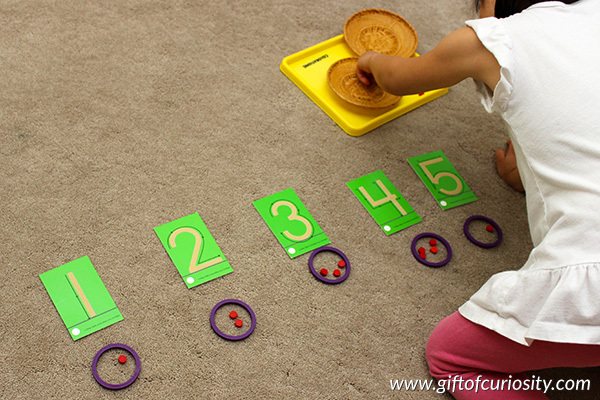 Once all the numbers were laid out in order, show your child how to put a circle below each number. Then have your child place the correct number of dots into each circle. In this version, you can start by laying out the circles and putting the dots into them. You can put 1 dot in the first circle, 2 dots in the second, etc. or you may wish to add some extra challenge to the activity by putting them in random order. 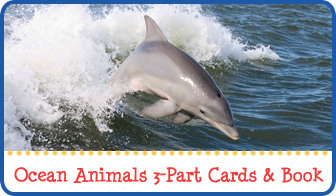 Have your child pick up a number card, say the name of the number, and trace the number with their finger. 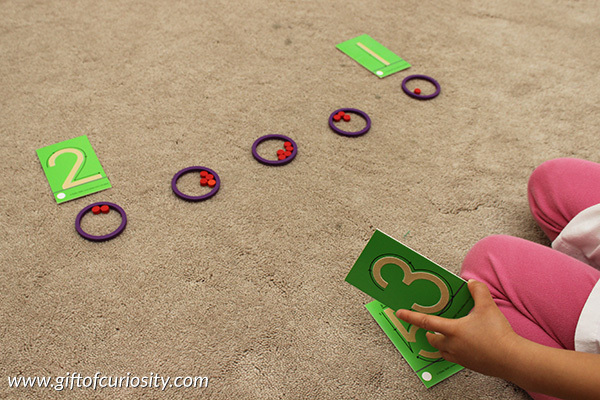 Then have your child put the number card down above the circle with the correct number of dots. When finished, your child can review their work by saying the number name, tracing the number, and counting the dots in the circle below it. 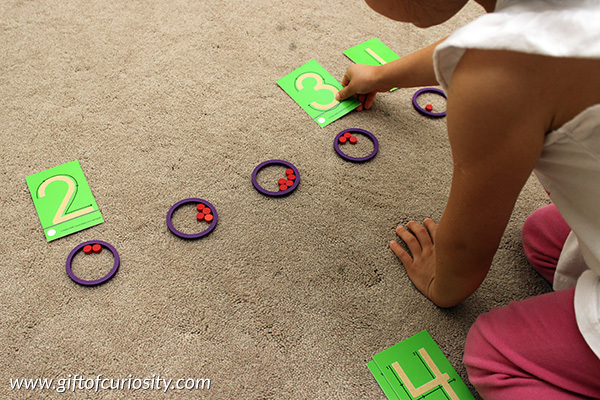 You can find more ways to teach numbers on my Math Activities for Kids page and my Learning Numbers Pinterest board. 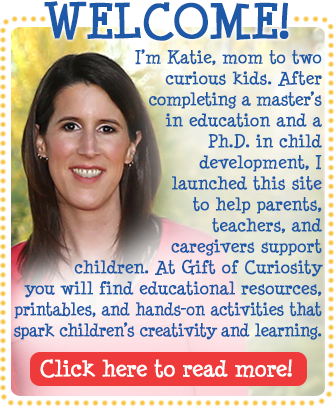 Follow Katie @ Gift of Curiosity’s board Learning Numbers on Pinterest.